All three species of bluebirds can be found in New Mexico. Both the western and mountain bluebirds nest in the state with populations of both species increasing in the winter as birds from further north migrate into the state for the winter. An isolated resident population of eastern bluebirds can be found in the very far southwest corner of the state. 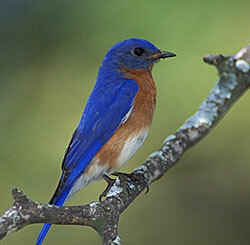 Eastern bluebirds also migrate into the eastern half of the state in the winter. Bluebirds are usually found in fields, open woodlands, parks or along golf courses or other open areas, including suburban locations with open spaces and scattered tress. In the mountains they are found in clearings and meadows. The mountain bluebird is well known for its hovering flight as it hawks for insects. The eastern bluebird has a musical flight call that often reveals its presence. 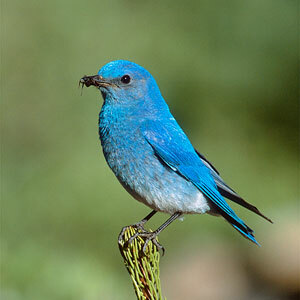 All three species of bluebirds nest in New Mexico, although the nesting range of the eastern bluebird is very limited. One, two and sometimes three broods may be produced in a single year. Clutch sizes vary slightly between the species. 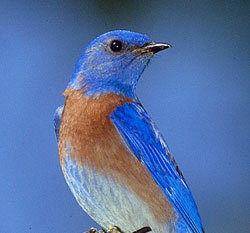 The mountain bluebird averages 4 - 6 eggs, the eastern bluebird 3 - 5 eggs and the western bluebird closer to 5 or 6. Eggs are pale blue or rarely white.